Annie graduated from the Queensland Conservatorium of Music with a Bachelor of Music ( Education ), Graduate Diploma in Oboe Performance and A.Mus.A in Piano. She received the University Medal for Oboe. Whilst a student at Brisbane Girls’ Grammar School, Annie was awarded a Certificate of Distinction for gaining the highest pass in the State for Piano. Annie has played in many orchestras and ensembles including Queensland Youth Orchestra 1, Brisbane Philharmonic Orchestra, Brisbane Symphony Orchestra and the University of Southern Queensland Sinfonia on both Oboe and Cor Anglais. 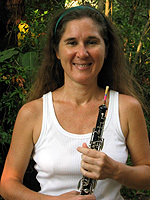 She has written a book entitled “Effective Oboe Playing and Reedmaking” with an introduction by the Director of the Queensland Conservatorium of Music. Annie has been the Director of Mythos Woodwind Quintet for over twenty years, performing for Musica Viva, Government House and live radio recordings. She has been teaching music for over twenty years both in her private studio and in Private and State Schools in South East Queensland, and is known for her high level of enthusiasm. Annie has taught at most of the larger Private Schools in Brisbane such as St Margaret’s Anglican Girls’ School, where she taught Piano, Oboe, Flute and Chamber Music for six years. Annie also enjoys accompanying for AMEB examinations. She has been on the Council of the Music Teachers’ Association of Queensland for eight years and during this time she has been involved in developing courses and setting guidelines for the teaching profession.